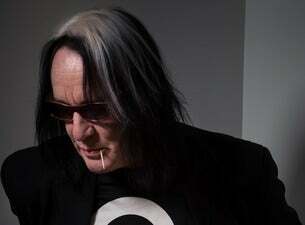 Rundgren's myriad production projects include albums by Patti Smith, Cheap Trick, Psychedelic Furs, Meatloaf, XTC, Grand Funk Railroad, and Hall And Oates. Rounding out his reputation as rock's Renaissance Man, Rundgren composed all the music and lyrics for Joe Papp's 1989 Off-Broadway production of Joe Orton's Up Against It (the screenplay commisioned by The Beatles for what was meant to have been their third motion picture). He also has composed the music for a number of television series, including Pee Wee's Playhouse and Crime Story. Rundgren recently performed his iconic 1973 album A Wizard A True Star in concert in its entireity for the first time ever. His latest studio album Todd Rundgren's Johnson, a collection of classic Robert Johnson songs, is being released this spring. • 1978: The first interactive television concert, broadcast live over the Warner/QUBE system in Columbus, Ohio (the home audience chose each song.in real time during the concert by voting via QUBE's 2-way operating system). • 1979: The opening of Utopia Video Studios, a multi-million dollar state-of-the-art facility. The first project produced by Todd there is Gustav Holst's The Planets, commissioned by RCA SelectaVision as the first demonstration software for their new videodisc format. • 1982: The first two commercially released music videos, one of which was nominated for the first-ever Grammy awarded for "Best Short Form Video" in 1983. • 1992: The release of "No World Order", the world's first interactive record album on CD-i. Also the first commercially available music downloads via CompuServe. • 1994: The release of "The Individualist", the world's first full-length Enhanced CD. • 1995: The world's first interactive concert tour. • 1998: Launches PatroNet, the world's first direct artist subscription service.